There is so little time to do so much remembering in…. This isn’t actually the beginning, in a number of ways. The real beginning might have been in 2006, when I found the first three letters, carefully typed up and pasted in my grandmother’s scrapbook, surrounded by pictures of a young man in uniform. He is smiling; he has the distinctive family smile that comes from certain last names on my mother’s side. Like my uncles and their cousins, he is tall and rail thin, towering above his grinning friends on the deck of a ship, arms locked, on their way to adventure. He writes beautifully, a change from the terse, semi-literate/floridly verbose missives that I am used to from years of reading about the Civil War. Pictures on preceding pages show him in a mortarboard, in high school, on summer vacation, playing with his dog, playing with his sister, and finally sitting somberly as a child, looking at the camera with sardonic trepidation. The real beginning might have been in December, 1941, when the young man left the comforting walls of Yale Law, wrote a short note home to his Dear Girls, and dropped off the radar for months. When next they heard from him, he had enlisted in the Marine Corps. Undaunted by the minimum weight requirement for the Corps, he ate bunches of bananas and drank gallons of water before his weigh-in, and passed. Yale and dreams of being a lawyer would have to wait. The real beginning might have been September 2, 1920, when the young man was born to a World War One veteran who became a Broadway actor and his wife, a former nurse, who raised him and his younger sister to value peace and humanity above power and conquest. Regardless of where the real beginning is, the story of this young man has expanded to include a vast range of characters. Some are living, some are long dead; some are Marines, some are friends; some are family, and others became as family. Some he barely knew, some barely knew him, or only knew people that he had known; some died beside him, and a few died for him. The young man never became an old man; the dreams of being a lawyer, of being married with four children, of finishing school and living a life never came true. He died as a Marine officer leading his men, and his last action was not to end life, but to save lives. The Corps gave him a medal. Four of his friends gave him everything. The young man has been gone for nearly seventy years, yet his memory still inspires tears in those who knew him. My own part in this story began many years ago. I have been devoted to history since a fascination with ships and archeology combined into a full-fledged obsession with the RMS Titanic. By the age of ten, I could rattle off lists of statistics and facts about the doomed liner, inserted it into every art project I could, and had even been to meet and “interview” Dr. Robert Ballard (being ten, I was far too shy to actually speak to my hero, and merely sat and listened while my father read my list of questions). The Titanic led, through a convoluted and not entirely clear passage, to the naval history of the American Civil War, which touched off the proverbial powder keg of military history. By 11, I had a large diorama of the Titanic sinking in the school library; it was soon joined by a “wreck model” of the Bismark, which I had painstakingly carved up according to the latest undersea pictures of the wreck. I had been vaguely aware that my family must have done something in the military in the past. My father’s mother referred to the Blitz in her more lucid moments; other grandparents mentioned the Second World War in the particular tones that members of that generation use when describing the watershed event of the century. There were a few references to “Uncle Ned” and “Gompy” being in the service, but details were not usually forthcoming, and I was concerned mostly with the Civil War. A chance find in a Martha’s Vineyard bookstore changed all that. I was reading the latest book of Dr. Ballard’s, about the ships of Iron Bottom Sound off Guadalcanal. 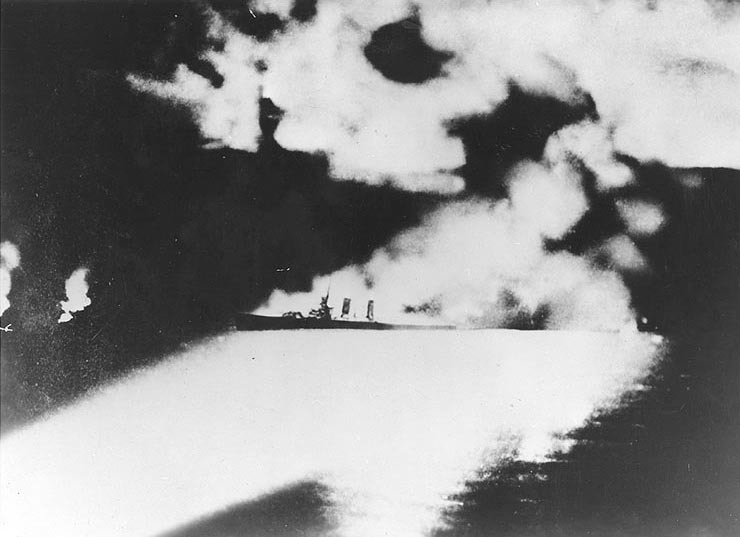 The Battle of Savo Island was under way; Japanese ships had come out of nowhere to decimate the American and Australian ships patrolling the sound. My grandmother came and looked over my shoulder as I leafed through some pictures. I looked at the caption. It was, indeed, the USS Quincy, CA-39. I had not known. Suddenly, the picture seemed almost three dimensional. The caption said that the photograph had been taken only a week before the sinking. I kept on reading about Savo Island. I was delighted to find Lieutenant Commander Edmund Billings mentioned in the text. 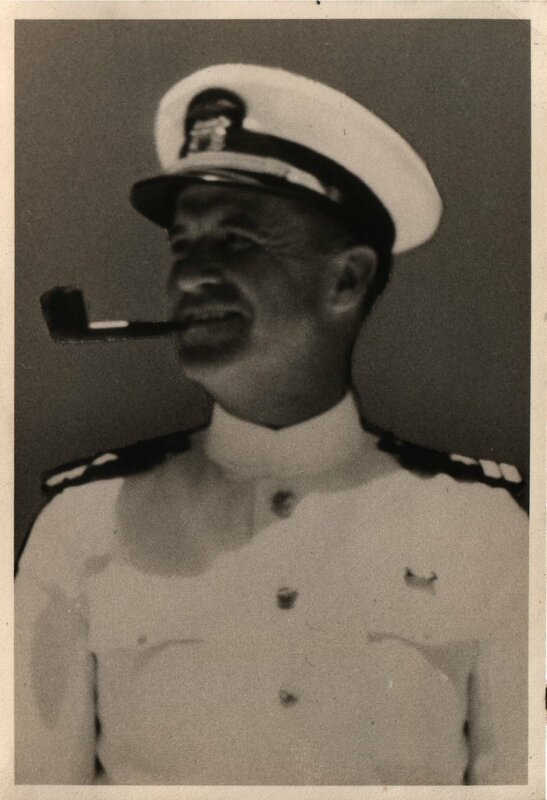 A two-line description of being woken up to take command of the bridge gave me a jolt, and I pictured a dignified looking man in his forties, carrying a pipe and assuming a fatherly sort of air to the young midshipman who had woken him. Several pages later, the Quincy was in bad shape. The Japanese fleet had completely surprised the Allies, and shells were raining down on the American cruisers. A photograph at the top of the page showed a chilling sight: the Quincy, her burning hulk starkly illuminated by searchlights, with nowhere to hide. I read on, until I reached the last reference to Uncle Ned. I was horrified. I could clearly see the ship’s bridge on fire, having taken a direct hit that killed most of the officers. Lieutenant Commander Uncle Ned stumbled from the flaming ruins – half of his face was gone. Someone heard him say, “Everything will be fine, the ship will go down fighting,” before he fell lifeless to the deck. Silently, I flipped forward to the pictures of the expedition. There lay the ruined Quincy, battle-scarred and rusting, on the floor of the sound. Most of her rear superstructure was gone. The tip of her bow was sheared off, whether during the fighting or when she hit the bottom. The pilothouse showed the scars of battle, yet illuminated in the lights of the submersible, it looked much as it did the day of the battle. I was looking at the place where a relative of mine had died; someone who was not just a figure in a historical record, but a person my grandmother remembered and loved. I don’t remember exactly when I first heard Phil Wood’s name mentioned, but it was probably my grandmother again. He was another relative, somehow connected to our family in California, and had died in the Pacific like Uncle Ned. I logged the information away, concentrating on learning about the Guadalcanal campaign, and then letting it fade entirely as I grew old enough to join a Civil War reenacting regiment. All my energy went into my new found hobby, and research books and memoirs of the 1860s gained the favored bookshelf space. I learned I had at least one Federal soldier in my background, and some cursory Web searching turned up several more possibilities. One, a private in the flashy 14th Brooklyn, shared my last name, came from the same area of Germany as my family, and even (I thought hopefully) resembled my dad, though any connection to the staunch Chasseur would doubtless be a distant one. My grandmother, a prodigious genealogist, keeps her scrapbooks on her living room table. These massive tomes contain photographs, letters, personal recollections, and Internet research compiled into thoughtful essays. I was casually leafing through her latest effort and marveling at her thoroughness, when I saw the first letter, supplemented by a picture of three smiling men in uniform. I read through the three abbreviated missives, and was speechless. This was the Holy Grail of any history buff – letters from the front lines – and from a family member, no less. I grabbed my computer and typed them up word for word. During my senior year of college, a package arrived from my uncle, containing every one of Phil’s letters. They had been carefully transcribed and typed decades ago by his younger sister; Phil’s handwriting was notoriously bad, and she wanted to save their contents for the family. It is fortunate that she did, because in the sixty years between his writing and my discovery, the original letters were lost. In the years that followed, the story of Phil Wood and the First Battalion, 24th Marines grew far beyond a scrapbook clipping . The entire collection of Phil’s wartime correspondence – nearly fifty pages – has been collected, edited, and re-edited. Inquiries were made to veterans, and mail exchanged with a survivor of Phil’s platoon. The letters were found by a producer from PBS, who re-wrote a documentary script to include them; photographs, interviews, and USMC official footage gave life to a story that already read like a movie. Archives were visited and records examined; transfers and mentions of other names expanded the project from one company to an entire battalion. The story of Phil Wood’s time in the Marine Corps is not solely his. Each name he mentioned was an individual Marine with a life and family behind him. The veterans I spoke to – George “Gunga” Smith, Al Perry, Bob Williams, Wally Duncan, Jim Jackson – were fortunate to come through the war at all. The company suffered 97% casualties from the original contingent; only 26 of those men survived (and only seven – including Al Perry – had never been hit). They earned an astonishing number of awards for their bravery, and suffered unimaginable horrors as young men simply because they believed in their country and their comrades. From their training at Parris Island, Quantico, New River, and Camp Pendleton, to combat on Roi-Namur, Saipan, Tinian, and Iwo Jima, men from all parts of the country and all walks of life showed an intense dedication to their purpose and to each other. Able Company’s enlisted machine gunners, 1943. PLEASE NOTE: all information contained on this site is the result of my own research, unless otherwise cited. To the best of my knowledge, it is correct, though I welcome any feedback or corrections. Also, the site is far from complete, and stories and conclusions may change as more information becomes available. Finally, a most sincere thank you to everyone who has helped with this ongoing project. There are far too many to name. Everyone who traipsed through a cemetery to take a photograph of a headstone, shared a photograph or a memory, who corrected a typo or made a suggestion, and everyone who took an interest and gave me encouragement: this would not have happened without you. 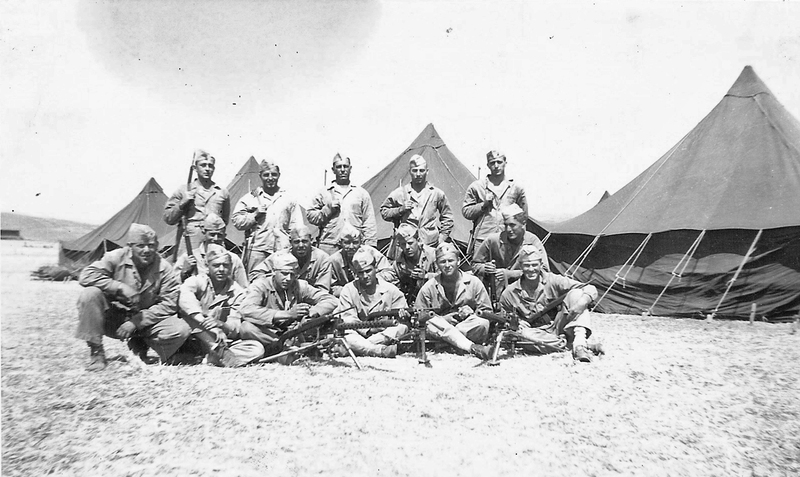 Do you have the names of the men in the photo of Able Company’s enlisted machine gunners above? 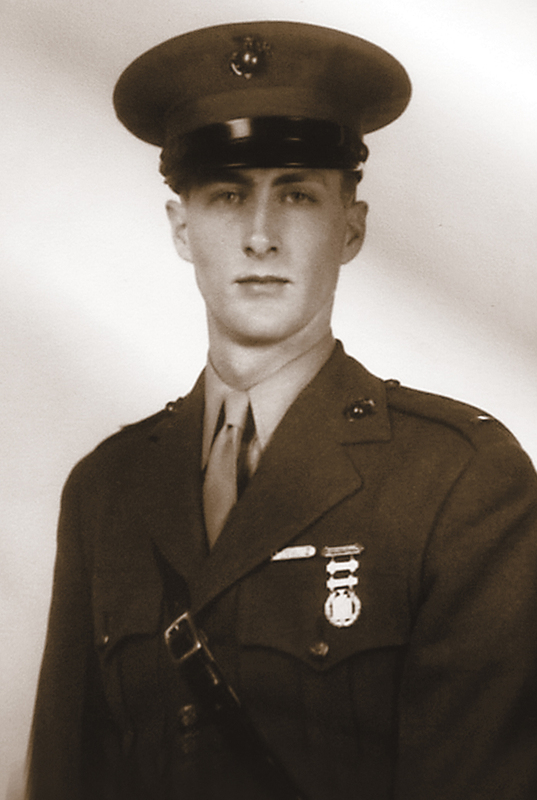 My uncle Luther Diehl was a sargent machine gunner for Able company and died on Iwo Jima. I have some photos of him but looking at the photo above cannot tell for certain if he is one of the men in the photo. Geoffrey, thank you for the work you have put into this. It is a touching tribute to the memory of these marines. I wanted to ask if you might have any additional photos of Arthur Sundgren, he was my great-great uncle. Hi Gabriel, thanks for writing in! I’m afraid I don’t have any other photos of Arthur Sundgren. The one I found was attached to a family tree on Ancestry.com, and I haven’t yet turned up another one. Private Sundgren’s Purple Heart certificate was recently up for sale on eBay – I’m not sure who the winner is, but hopefully it went to a good home. If you’ll send me an email at missingmarines@gmail.com, I’ll be happy to help you learn more about his time in the service. Hello there. Would love to have a transcript of the Battle of Saipan, particularly Charlie Company. Our great uncle, Private H.J. McCaleb, was killed in that battle. You used to have some good information, as well as his bio, posted. We can’t access it any longer. Thanks. Hi Ava – The older version of the site had some pretty critical errors, so I took it down for revisions and have been (slowly) working my way through the changes that need to be made. Please email me at webmaster@ablecompany24.com and I’ll be happy to help you find the information you’re looking for. I’m trying to learn more about who you are. Your Uncle Ned is my children’s’ great- grandfather. Ned ‘ s youngest son was Robert Billings, the father of my x – wife, Elise , who is the namesake of Ned’s wife Elise Garceau. I clearly remember Bob (Robert) reading me the Savo passage about his father, Ned. Who is your Grandmother?….and what is your last name? Through which sibling is Ned your Uncle? Thanks for your help and doing a great job with the blog. Hi Dale – just sent you an email! I sincerely appreciate what you’re doing with this site. My Grandfather was Charles Luther Tackett and he served in Able Company on Iwo Jima. He was wounded there, and never spoke with me about the war. I have recently become interested in the Pacific and have been trying to understand his service. After Charlie’s death, my father found some relics from the War ( Charlie’s KaBar, a Japanese dagger, photographs), but your research has been more helpful than these items and provides needed context. Thank You! Hi Russell – thanks for the comment. I’d be happy to help you learn more about your grandfather’s service! Will be in touch via email. Aloha Gentlemen. My name is Jim Bongaard. I served in the Navy aboard the USS Kirk during Vietnam. I am the founder of the USS Kirk Association. But the real reason I am posting is that recently I moved to Maui and become intrigued with the WWII efforts on this island. I have my own handyman service and recently I did a call near Camp Maui and Giggle Hill. The property owner showed me some concrete foundations on the property which she explains was part of Camp Maui based on neighbor accounts. I was able to locate their property and the structures there based on the one arial photo common on your site and others. I sure would like to cull the minds of my Semper Fi mates that were there at Camp Maui to help identify structures and maybe have other photos. I hate to see history fade away. Please help me preserve the history. My old number from NC. I recently obtained a group of photos that belonged to Alfred Eskildsen, who is shown as a member of C co., 1/24. I would gladly forward copies of these and other info to you to include here. Would I just email it to you? I am a former Marine (1979-83) and in 1982, our unit deployed to Tinian. Our group was the first large deployment of US Marines there since WW2. While, there, we got a weekend of leave on Saipan. We took a ferry over to Saipan from Tinian. One of my friends was taking pictures of the Saipan shoreline as we approached. He said he was going to send them to his Dad, as his father had landed on Saipan with the 4th Marine Division. My friends name was Rosenblum. Thank you for keeping the memory of this unit and these men alive. Thank you for your offer, and for your service Mr. Barnitz! I’ll send you an email directly. Hi, I was wondering if you had any info on George D Briggs, PFC 24th Marines , KIA 23Feb 1945 on Iwo Jima? He was my great-great uncle. What a great thing you have done here! My Grandfather is Lt. Colonel William David Masters. Thank you for honoring one of the greatest men in my life. I just wanted to say thank you for publishing this fantastic page. I am riveted, excited, and saddened reading all of these stories. Thank all of you fine men for serving! Thanks, Chad! First Battalion never got the popular attention that some units enjoyed, but its stories are fascinating. I only wish they could all be told. Hi, My name is Matthew Peters. My grandfather, Willard(Will) Roberts served in Able Company from 1942 – 1945. Just wondering if you have any information or photos of him. I was little when he passed away and our family doesn’t know much about his time in the service. My granddaddy was Audobon Lee Luna “Jack”. Helping my fiance with his family tree and intertwining our families, I stumbled upon this site. What a wonderful treasure to see my handsome grandfather and to confirm a family rumor! He fought in Iwo Jima! Thank you so much for taking the time to do this! What a gift for us all. Thank You. They were amazing and it brings to mind how much more my Dad was and they all were. If anyone knew or has anything about Wesley T. Whaley I would love to hear from you. Hello. Thank you for creating this tribute to the Heroes of WW11. My Uncle was a member of Dog Company, Raymond M. Rodgers. I have a photo of him that I would like to upload for inclusion on your site. Please advise how to do this. Thanks. Tom Rodgers Jr.